One of the nation's top recruits announced his decision on the KARE 11 News at 10 Tuesday night. 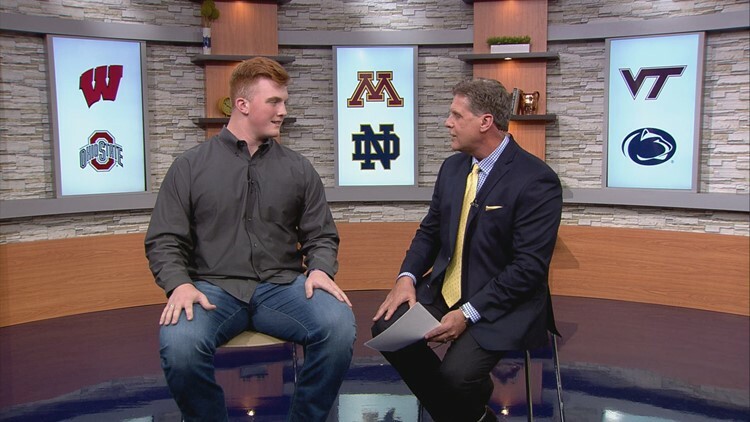 EDINA, Minn. - Minnesota's top high school football player, Quinn Carroll, will attend the University of Notre Dame. One of the nation's top recruits announced his decision on the KARE 11 News at 10 Tuesday night. The 6'6", 290-pound Edina offensive tackle is rated the 6th best offensive tackle in his class by Rivals.com. ESPN has him listed as one of the top 175 high school football players in the nation. Carroll had dozens of offers (34 Division I) from the nation's top football programs. One the first day he could be recruited, he received more than 200 letters. His six finalists were Minnesota, Notre Dame, Ohio State, Penn State, Virginia Tech and Wisconsin. Carroll's father played football at Minnesota. His brother played college ball at Virginia Tech. Ultimately, Quinn wanted to forge his own path and felt Notre Dame, both on the field and in the classroom, was the best fit for him. Carroll will be in uniform for his senior season for the Edina Hornets this fall.